Sol Boards is co-owned by Doug and Tana Tolson and was started out of their shop in December 2010. As a general contractor and do-it-yourselfer, Doug decided to make Christmas gifts for family members. Always creative with wood, he came up with the idea of making cutting boards using scrap wood from other projects. After he completed them, he posted pictures of his creations on his Face Book page. That’s all it took… what began as a gift, soon grew into several requests from friends and family. After taking a few orders and hearing rave reviews, he and Tana decided to take it a step further. It always amazes them to hear people respond with such positive words. They are extremely appreciative and feel blessed to be able to share their talent with others. 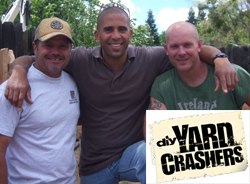 Catch Doug doing home and yard improvements on the DIY Network’s Yardcore and all of the Crashers series! Doug and Tana live in California with their three kids.